Hook in: Brooke Flanagan with some of her Brooke’s Canteen healthy and nutritious creations. Brooke Flanagan says seeing kids arriving to school with last night’s doner kebab, cold leftover pizza and even a frozen meat pie are seared in her memory. It’s one of the reasons she decided to do something about it and last year established Brooke’s Canteen, which makes and sells healthy, nutritious food in local primary schools. 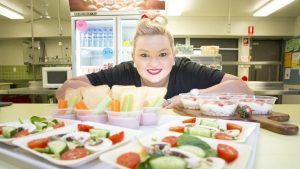 Ms Flanagan, who was born in Bankstown Hospital and raised in Campbelltown, runs Brooke’s Canteen at Campbelltown North public school and Sackville Street public school in Ingleburn. The mother of two daughters, Ruby, 6 and Lulu, 4, knows first hand the pressure on time poor parents to provide healthy meals to their children. “Being a parent I know how easy it is to just go through KFC drive thru or order pizza with being run off your feet looking after your children, so I thought opening canteens that sold the healthiest food possible would encourage children to eat healthier, broaden their knowledge on what’s healthy and provide them with the nutrition that some unfortunately don’t get at home,’’ says Ms Flanagan. Growing up, young Brooke attended Rosemeadow Public School and Ambarvale High School years 7 to 10, followed by Thomas Reddall High School years 11 to 12. “My childhood definitely led to me opening my own canteens as a lot of it consisted of me being in the kitchen with my mum and her teaching me how to cook from a very early age because I always took an interest in it,’’ she says. Before Brooke’s Canteen came along, Ms Flanagan worked as a room leader in childcare for several years. She also did a stint as production manager in interior design before she became a stay at home mum with her two girls. Creating Brooke’s Canteen to serve healthy fare for breakfast, lunch and recess at school was almost inevitable. 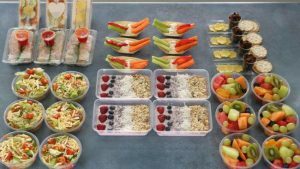 “Growing up my brother and I were always fed delicious home cooked meals but portion control was nonexistent – we could eat what we wanted when we wanted,’’ she recalls. A year on, Brooke’s Canteen also services the catering market and has created a special menu for staff development days and other special events and functions. 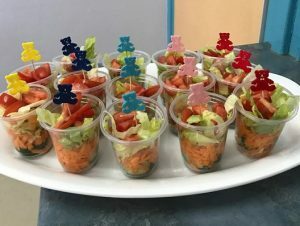 Brooke’s [school] Canteens are both going well, but Ms Flanagan is planning for it to be an even bigger positive influence on children and their dietary habits. “My plan for the future is to expand Brooke’s Canteen and assist the department of education in any way possible to help educate children so they can have the best start to their bright futures ahead,’’ Ms Flanagan said. 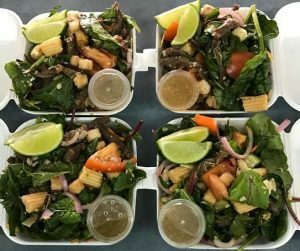 “As far as opening a canteen in high schools I’m not focusing on that right now as I have so many fantastic ideas to implement for primary school students at the schools I have canteens. ♦ For more information on Brooke’s Canteen visit the website here.